Pool and spa owners are always looking for something quick and easy. It's an unbeatable test system: no caps to worry about and even greater moisture protection. 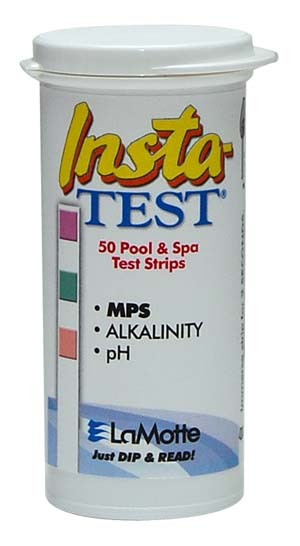 Lamotte guarantees the Insta-Test® pool and spa strips will help you maintain proper free chlorine levels and balanced water. The only strip with no required waiting period. Just swirl 3 times and read! The patented vial protects strips from moisture intrusion Free. Monopersulfate (MPS) strip measures MPS in low, ok and high levels of MPS, Alkalinity 0 to 240 ppm, and pH 6.2 to 8.4, with instant results.